I love to write this blog, as many of you know. There is nothing quite like sharing my thoughts and words with my readers - but as much as I love this blog there is something I love even more, and that is seeing my work in print. I admit it. I might be an online blogger but I am also an old school kind of girl, one who loves books and newspapers and magazines. I love to write and so to see my works published is an amazing thing for me, and a proud moment. 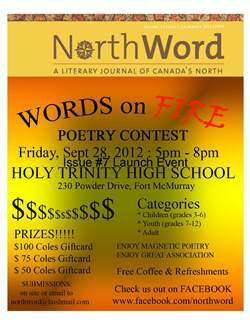 One of my very proudest moments recently was when one of my works was selected to be published in NorthWord Magazine, our own literary journal based right here in Fort Mac. NorthWord is a labour of love, people. It is not a huge profit-generating machine, and nor is it full of glossy ads. It is a magazine for and by people who love the written word, which means if you are reading this blog it's quite likely for you. It's full of stories and poems from northern writers, and, in the most recent issue, it has a small story from me. The story I tell in NorthWord's 7th issue, titled "Harmony", is a personal one. It is close to my heart and I admit I struggled a bit with submitting it because it is so very personal. When I saw the magazine, though, saw my headline and my name underneath, I wept a bit because I was so proud and because I was so pleased to be able to share my story with the world this way. And NorthWord gave me that opportunity. This Friday night will mark the launch of "Harmony", Issue 7 of NorthWord magazine. It will be an evening of poetry and fun, and it's meant for the entire family. It's meant to introduce you to the magazine if you are not familiar with it, and it's meant to show you some of the literary talent we have right here in our community. I was delighted when I was asked if I would read my piece at the launch of the latest issue on Friday night. I will try to do so without crying, although given the subject matter it may be difficult because it is an emotional story for me. To have the opportunity to tell my story through a lovely little publication like NorthWord has been an honour, though, and to share it with an audience is an even greater one. NorthWord is the magazine meant for everyone - and so you too can submit a story or poem to NorthWord should you wish to share your story with the world. And I can tell you this - when you open up the magazine, and see your words, when you see your name underneath your title - well, there is no other feeling like it in this world. I know, because it happened to me.